My 6 Degrees of Separation From … J.K. Rowling! All week long I’ve been picturing interconnecting friendship circles. Smaller ones and bigger ones, some that overlap and some that don’t, but that generally trend outwards. I think of my writing communities this way. In fact, I was thinking about this topic last week when I wrote a post on my blog — Serendipity Will Meet You Along the Way — about how we never know what might happen through our communities. There’s lots of potential for serendipitous events. OK, so … I’m sick <sniffle> <cough> so bear with me. 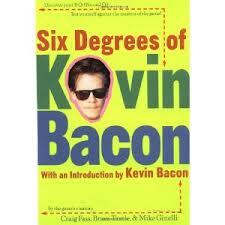 All this thinking about overlapping and expanding circles got me pondering the 6 degrees of Kevin Bacon. You know this game, right? From him, you can land on anyone in the motion picture industry (dead or alive) within six degrees of separation. It’s amazing actually. What about the 6 degrees of Lisa Alber? Who is the most outlandishly unlikely author I could know within 6 degrees? Stephen King and J.K. Rowling come to mind. I choose J.K. Rowling because she seems more farfetched. She’s British, for one thing, and she gained fame by writing YA fantasy, which is a far cry from what I write. Plus, her fame was so stratospheric she’s practically another Royal. 1. Johnny Shaw, another Portland mystery writer and an all-around hilarious guy. 2. Marcia Clark. Yep, former O.J. Simpson prosecutor, now bestselling mystery author. She and Johnny met at a conference a few months ago. I was there. I saw it, so I know. He moderated a panel she was on. 3. Joshua Kendall, Editorial Director of Mulholland Books, Marcia Clark’s publisher. 4. J.K. Rowling! In case you don’t know, she’s now a mystery author, and Mulholland Books is her U.S. publisher. Only 4 degrees of separation! I can count J.K. Rowling among my peeps now. Seriously. Her first mystery novel in a series came out this spring, mine’s coming out in March. We have TONS in common, don’t you think? So, who’s within your 6 degrees of separation? (Later, Thursday night) Whoa, wait!! I’m actually only THREE degrees of separation from my new friend, Jo. (No one calls her Joanne, by the way, much less J.K.) Poking around just now, I discovered that Greg Rucka, who I’m going to meet in two weeks at a reading event, is also published by Mulholland Books. How fun! I think if we all started playing this game, we’d have a lot of well-known authors in our overlapping circles. That’s for sure — between the five of us, we’re definitely well-connected! I would have to research Jo to know how many degrees away I am. I suspect as many as Kevin Bacon. Oh, wait. I’ve met Tom Hanks, and he was in Apollo 13 with Kevin Bacon, so only two degrees there! Tom Hanks, you’ve met Tom Hanks? I want to hear about that!